For years I admired these odd but cheerful-looking flowers in other people’s gardens. Out on my run, I’d think, “I wonder what kind of plant that is? I’d love to have one in my garden.” They were sometimes the only blooming plant in winter gardens, and they burst forth with greater vigor in early spring. Last year, a friend posted on Facebook a picture of some of them blooming in her garden, calling them by name. Thanks to her, I finally knew what to look for at my local nursery: Lenten Roses. 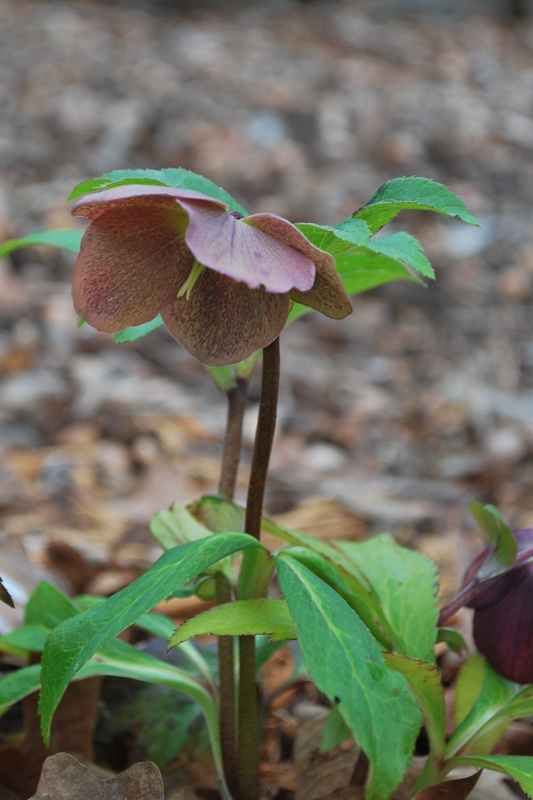 One of my first Lenten Roses (Hellebore). Its profusion of blooms makes me happy. I bought two last spring to plant in a new garden bed my husband was building around our lacebark elm tree. And I bought four more this fall. They’re all growing, and that brings me great joy. I’m already planning where I’ll add more, but I just missed a sale at my favorite nursery, and they’re not the cheapest plants to buy. Plus, it has been too darn cold to spend a lot of time outside digging in the dirt just yet. A message on one of the plants from the fall has really stuck with me: Will self-sow where happy. Isn’t that true of us humans, too? Don’t we sow more seeds of happiness where we are happiest? We like to stick around in those places of happiness and visit them again in our memories. 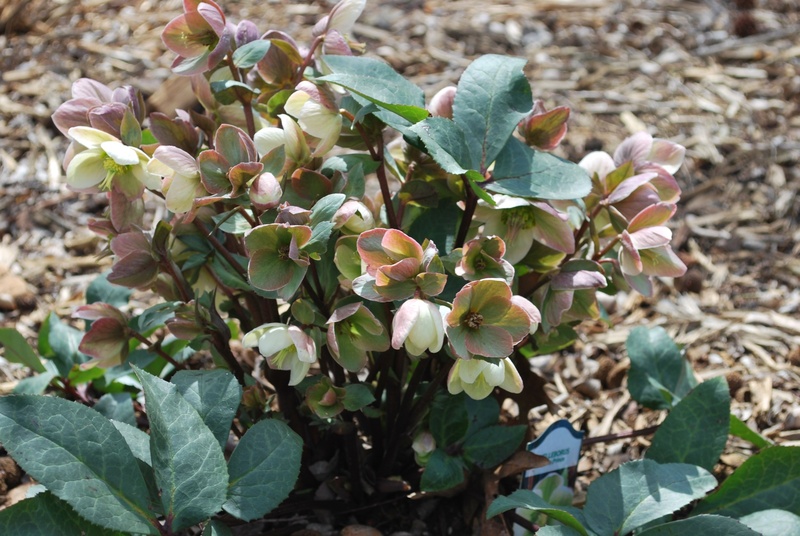 The particular plant that promised to self-sow where happy is the only one of the Lenten Roses that hasn’t bloomed yet, but its leaves are growing, and that alone makes me happy enough for now. The others bring me joy in their hardiness and their delicate-looking petals, a juxtaposition that seems odd but comfortable on these plants. Perhaps one of the things that brings me such joy in these plants is the challenge they present to me when I try to photograph them. (Yes, some challenges bring me more joy than exasperation.) It’s true with the Lenten Roses. I simply haven’t found a way to adequately capture their beauty, the way their petals are almost translucent in the sun, the intricate textures and patterns some of them hide as they bow demurely toward the ground. That demure bowing of the head makes them particularly hard to capture, especially because they don’t grow to be very tall, and I and my camera just can’t seem to find an angle that’s perfect for shooting them to show off their best advantage. I’ll keep trying, though, because it brings me happiness. 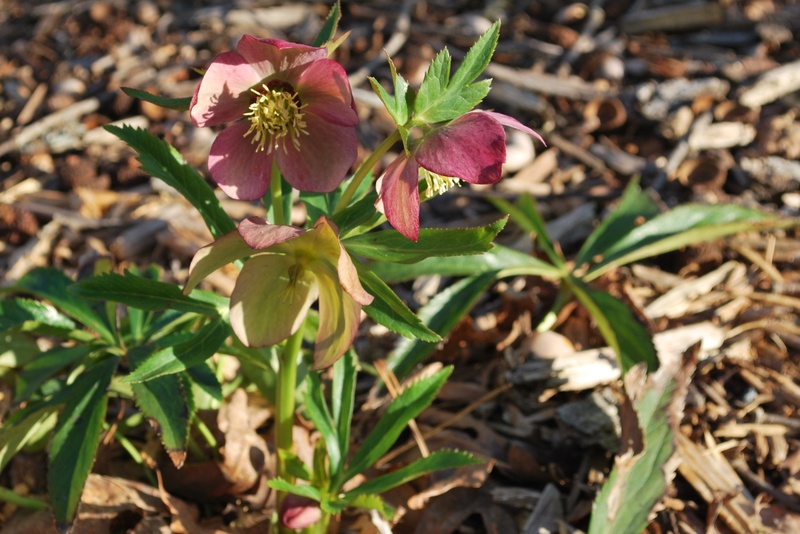 Lenten Roses are so-named because they typically bloom during the holy season of Lent. Mine have been blooming heartily for months now, but they’ve become especially beautiful to me this particular season of Lent because the rest of spring seems to be delayed. We have had an appropriately gloomy, somber Lent. Lots of rain and days of gray clouds and temperatures much colder than normal. I know many of you can relate, and many of you have snow covering your own flower beds where usually you might see early bulbs peeping through. But following the somberness comes joy and happiness. Following the winter comes the rebirth. Following the death comes the resurrection. And that’s exactly the promise of the Lenten Roses and the Easter Sunday they announce. If you’re facing cold, gray, somber days, hold on to the promise that Sunday brings. Life is coming back, and with it, a reason for joy and new growth. And sometimes isn’t the promise of new life exactly what we all need to self-sow more happiness? Happy spring. Happy warmer days on the horizon. But most of all, happy Easter resurrection, my friends. 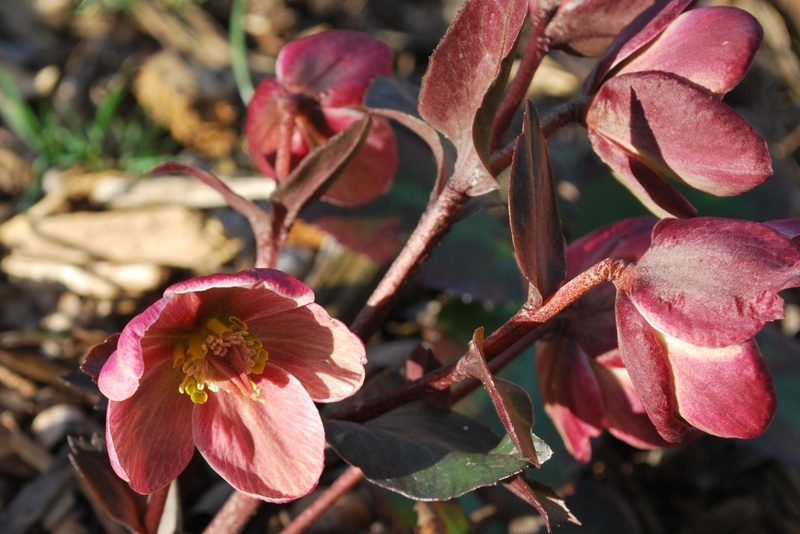 This entry was posted in flourishing tree and tagged Easter, garden, happiness, hellebore, joy, lenten roses, photography, resurrection, Spring, winter by hopesquires. Bookmark the permalink. Thank you so much for sharing your experiences with these lovely Lenten Roses about which I knew nothing until now. What a timely ending to Lent and a beautiful reminder of God’s handiwork pointing towards Easter Susnday! “He is risen! He is risen indeed! ” we will be saying shortly. May we be the obedient servants He has called us to be which will enable us to sow into the lives of others! Joy! Joy! Joy! Praise be to God in heaven on high! Joanne — thanks for your uplifting message. We are called to share the good news of Christ’s resurrection in this season, and I love that there are flowers to help remind us. Happy Easter to you! I have a Lenten Rose bush, but it’s still covered by 2 feet of snow! Our Minnesota spring is severely delayed. Thanks for letting me vicariously enjoy your blooming Lenten Roses self-sowing their happiness. I love that! Tracey — I hope spring will be there soon and that your Lenten roses will bloom abundantly. Happy Easter!